‘Forever’ not just between the hours of 9am and 5pm (excluding Bank Holidays). God loves us all day every day, even when our actions do not reciprocate this. Therefore, living as if God was a part-time deity became unsustainable and failed to provide genuine happiness. Over time, through three simple, but crucial ways, I began to realise this and found real joy. 1. Daily Prayer and Reading of Scripture. through actively committing each moment of my life to God and starting my days by praising His name or learning more about how I can live a life closer to Him, I have found a much deeper sense of peace. As a child growing up I never had any Christian friends so I was pulled in many directions about how to act and what my values were. At this time in my life, I was even more split in what I believed. Having friends, in UCO, who were willing not only to walk with me in my journey but were also willing to call me out when I was acting less than I am called to be. It is so important that we, as Christian women, walk with our sisters in Christ and are able to meet them where they are. We are not called to be Christians alone and I owe so much to these friends who knew long before I did what I needed to grow in my faith to be able to find the peace I so desperately craved. I was doing lots of things, hanging out with lots of people and consuming lots of media that was getting in the way of my relationship with Jesus. As I began to grow in faith, through sisterhood, through prayer, I began to forgo certain nights out or hanging out with certain friends. This was not an overnight decision but one that became natural as my life began to look differently. In turning toward Jesus, I was naturally turning away from activities that I had previously loved. I became aware of the effects they were having over me and how they were an unfulfilling way to spend my time. My relationship with many of my friends changed and I really grew to value the friends that stuck by me and supported me in who I was becoming. This form of sacrifice, although not as dramatic as the sacrifices spoken of in the bible, is difficult and should be acknowledged as such. Sacrificing these areas of my life was potentially the hardest thing I have ever done and they only became possible over time as I grew closer to God. However, these choices were made in favour of something so much greater. That something greater is a relationship with Jesus Christ and the knowledge that He loves me eternally and that He will always be there as a source of comfort and peace. By keeping my eyes on Jesus all of the time, I rest assured that He is by side always and I have found a peace and joy that goes far beyond any empty earthly pleasure ever could. When in moments of doubt (of which there are many) I can always turn to Psalm 16: 8 – 11 and be truly reminded of this. 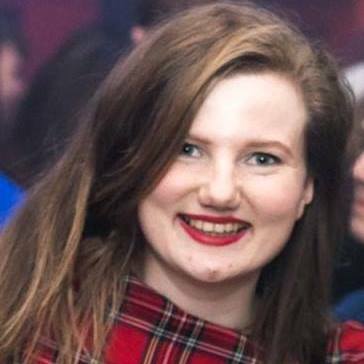 Rachel has just completed her undergraduate degree in Theatre Studies at the University of Glasgow. She is a member of University Christian Outreach Glasgow. (UCO Glasgow) She is the definition of extroverted and is also vegetarian. She spends her spare time either dancing or drinking coffee, though rarely at the same time.